Golden Technologies Compass GP620CC heavy duty power wheelchair with captain's chair offers users a stable, center-wheel drive platform and an articulating chassis for stability over tough terrain. The compass HD has a 450 lb. weight capacity yet a tight 20" turning radius. 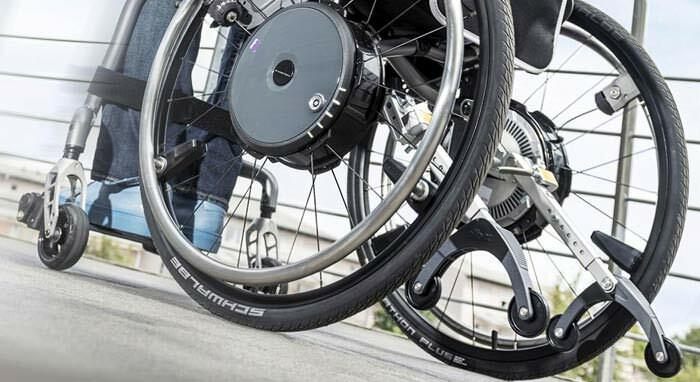 The compass HD wheelchair comes standard with a two-tone charcoal/grey captain's seat with fold-flat seat hinge design for easy transport. The Compass HD also; features front and rear height adjustable seat posts, padded flip up armrests, easy to use sliding seat bracket and a fully adjustable footplate. Rear (Flat free tire) 10" X 3.5"
Casters (Flat free tire) 6" X 2"
Seat width x depth 20" X 20"
Height adjustable footrest 3" - 7"
Ground clearance to transaxle/motor 3.5"
Height (ground to top of back of seat) 38.25" - 42.75"
Height (ground to top of back of headrest) 47.25" - 53.75"
Standard configuration includes fixed in-line joystick mount, flip up armrests and a lap belt.